Dark Horse is thrilled to present a new edition of Steven Grant (2Guns, The Rook) and Vince Giarrano’s (Terminator) Badlands! Originally published in 1992 and long out of print, this second edition features a brand new cover by Tim Bradstreet. 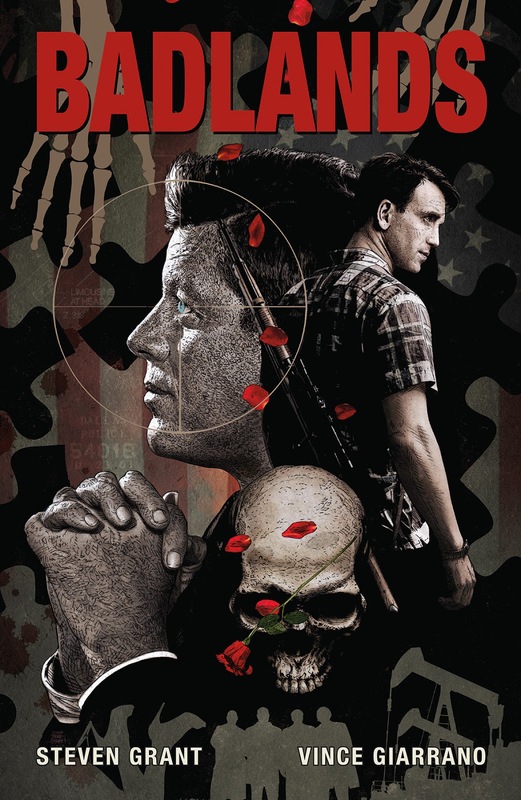 Badlands is a fictional crime drama that depicts the events leading up to the assassination of JFK and examines the longstanding question—was there a second shooter? Conrad "Connie" Bremen is an ex-con carrying the stench of a sordid, secret past. Connie just wants to get on with his life, but he's attracting the attention of all the wrong people: the mob, the CIA, and the FBI, just to name a few. They all have plans for Connie, whether he likes it or not—and some of those plans include the murder of a president. For Connie Bremen, the road to Dallas begins and ends here, in the Badlands. The new edition of Badlands goes on sale March 14, 2018, and is available for preorder on Amazon, Barnes & Noble, and at your local comic shop. Visit DarkHorse.com for more information.